Montreal is made up of unique neighborhoods, all with different sights and atmospheres, and the ideal way to explore them is on a bike. As a very bike-friendly city, Montreal has miles of bicycle paths, and your bike rental includes a map of these great trails. Old Montreal is one of the most popular neighborhoods to explore by bike and is relatively flat. 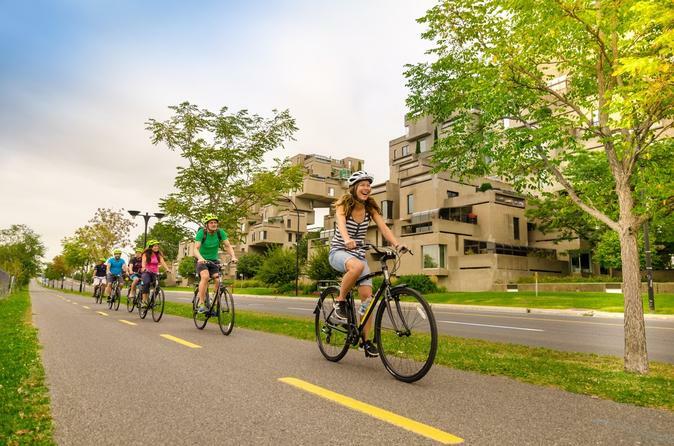 Cycle along Old Montreal's cobblestone lanes and stop at historic sites. Great museums, shops, cafes and French bakeries line the streets, and with a bicycle, you have the freedom to stop wherever you'd like. From Old Montreal, you can ride along the scenic waterfront and visit the Port of Montreal. Bordering Old Montreal is Chinatown. Montreal's Chinatown is large and bustling, full of amazing restaurants, shops, Chinese medicine stores and candy stands selling the popular, made-to-order "dragon's beard" candy. You are free to discover all the other great neighborhoods, like downtown, The Village, Plateau Mont-Royal and Rue Crescent, at your own pace. Cycle wherever you please! A hybrid bike option is available for casual, easy sightseeing.